To be honest scented top coats or nail varnishes are a bit of a gimmick, I know we all like to smell nice but sniffing your fingers in public is probably best avoided. 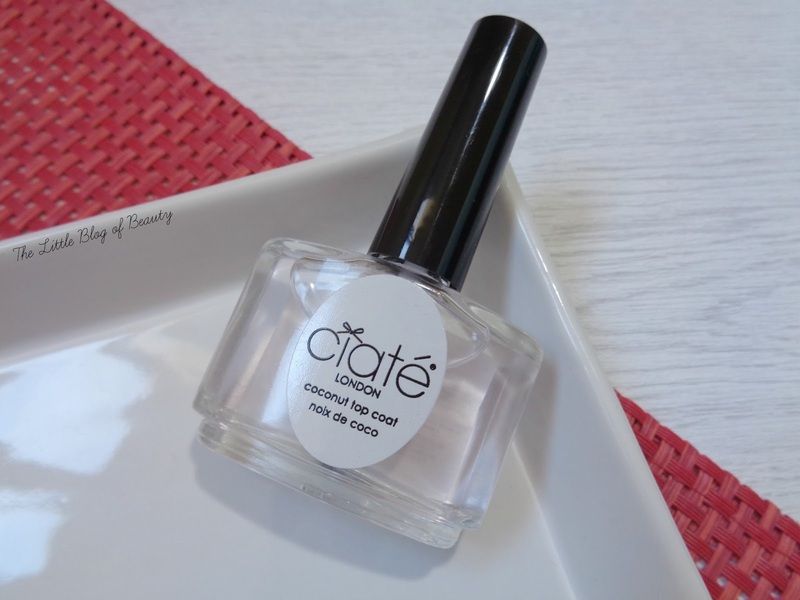 But as a general coconut scent lover I was definitely curious when Ciaté released a coconut scented top coat. I wouldn't have paid the full £9 for this, but when I spotted it in TK Maxx for about £4 I decided to give it a shot. I believe this was originally introduced as part of the South Beach Socialite collection. I loved the look of the collection when it was first released and they did actually have one in TK Maxx, but somebody had stolen the top coat from the box. This is available on its own though, as are all of the nail varnishes from the collection, and as I said on its own it's worth £9. Being quite an expensive top coat I did expect a lot from this and I found that it fell well short. The best thing about this was actually the scent which did smell like coconut, although not quite the sun lotion kind, and lasted for a couple of days. I was wearing this when I went round to a friends house for the evening and as we were talking about nail varnishes (not all evening obviously) I told her about this and offered her my fingers to smell. Awkward. One thing I noticed straight away was how thin this appears in the bottle with a consistency much closer to water than nail varnish. If you tip the bottle it kind of swishes around. I didn't find this particularly quick drying (and I expect my top coat to dry pretty much instantly) and although it seemed to apply well I found that it dried streaky. This and the apparent lack of a glossy finish just made my nail varnish look awful and I just wanted to take it off. I'm still on the hunt for my perfect top coat after falling out of love with Seche Vite and this definitely hasn't satisfied my need. A nice scent that sticks around for a while doesn't make up for a streaky finish that is distinctly lacking in glossiness. What top coat would you recommend I try next? I love top coats for the glossy finish, but all the ones I've used leave streaky marks and it's so annoying! What a shame! Although scented nail varnish is a bit of a novelty, i'm somehow always drawn to it but always end up disappointed. Yet to try a Ciate nail varnish too. Thanks for the heads up, great post!